Victoriaville, Quebec, is a quietly bustling city of 40,000 people, located south of the St. Lawrence River between Montreal and Quebec City. There’s nothing about Victoriaville to suggest that it would make a particularly apt location for a festival of radical music, any more than most other North American towns or cities about 150 miles from a major urban centre. The Festival International Musique Actuelle in Victoriaville (FIMAV or Victo for short) exists (and exists where it does) because of the vision of its founder and director Michel Levasseur who as a young man seems to have decided that his home town was somehow the appropriate place for a coming together of experimental streams in jazz, improvisation, rock, and electronic music – that melange for which the French have the handy term musique actuelle. Levasseur has a keen sense of his community and his festival’s place in it. Each year FIMAV opens with a performance that seems particularly geared in some ways to the needs of the community, whether the music has specific cultural resonances (Jean Derome’s Canot Camping project of 2000 comes to mind), or just a strong affinity with folk music (last year’s mix of Japanese and Siberian idioms with Koichi Makigami and Bolot Barishev). 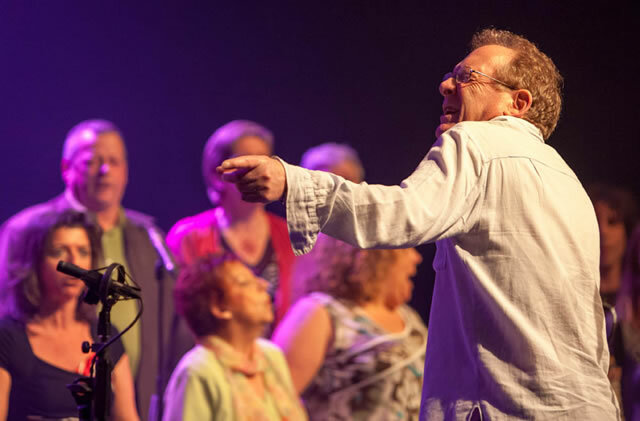 This year Levasseur found the ideal ensemble to express community spirit: a Victoriaville incarnation of Phil Minton’s Feral Choir. The concert began with an empty stage and imitations of bird calls erupting throughout the Cinéma Laurier theatre, the choir gradually accumulating on the theatre’s outer aisles and forming a procession to the stage. There Minton whistled alone until the 30-odd members of the choir erupted suddenly into massed collective talk as Minton began an extended conduction, both ritual and inventory, that would mine many of the voice’s possibilities in a unique collective realization. Minton would, in effect, dial-up the volume, match solo voice against the chorus, and lead sub groups into patterns of call and response. There was effective use of pointillism and a long and striking passage of chattering highs against slowly moving low-pitched lines. It was an exploration of the range of the human voice – shouts, whispers and the silence of maximum attention. Minton would raise and lower the pitches of sections to create complex modulations and harmonic movements of the freely assembled clusters of voices. There were also sudden cut-offs of bits of speech against a long sustaining drone. He would lead the group in rhythmic chants then suddenly accelerate them in a spirit of play in which the notion of leadership itself seemed firmly grounded in the idea of the group’s potential, a kind of tacit agreement rooted in a sense of constant subliminal dialogue. At time the choir’s activity sounded like a pre-condition of language, at other times like a hive, as if this free choir were engaged in a fundamental act of mimesis, the auditory equivalent of the ancient cave sites at Lascaux and Altamira where rituals took place in the midst of depictions of a world and its fauna that were at once nature and spirit. The piece concluded with a rapid exchange of shouts and silences, the limits of response, executed with impressive precision. While Minton is an ardent collectivist, he is also a virtuoso, extending improvisation to text settings, mining and multiplying meanings. The Phil Minton Quartet (John Butcher, Roger Turner, Veryan Weston ) thinks as fast collectively and individually as any group might and they have in the past performed portions of James Joyce’s Finnegans Wake, the ultimate work of verbal virtuosity (that work that Cage would so often seek both to undo and to celebrate by chance). In another virtuoso group, Simon Nabatov’s quartet with Frank Gratkowski and Nils Wogram, Minton has given a multitude of different voices to Josef Brodsky’s poem Nature Morte. For all those inventive flights, the act of improvisation for Minton is a keenly collective and political act. When he sings “The Cutty Wren” there’s a silent chorus drawn from at least eight centuries of the English working class. The Feral Choir concept integrates voice, improvisation, empowerment and the idea of a community in sound. Beginning with a three-day series of workshops, the choir culminates in a performance. It’s a series of activities in which creative expression is sought in the group, and it suggests that community is rooted in spontaneity. Minton started the idea of the Feral Choir in the late ‘80s as a gradual outgrowth of vocal workshops he’d been conducting. Since then he has developed the practice with Feral Choir performances arising around the world. In May 2012, he led Feral Choirs in both Ottawa, where it was organized by sound poet Max Middle and took place at St. John the Evangelist Church, and in Victoriaville. Stuart Broomer: How did the members of the choir first respond to the idea of the Feral Choir? Suzanne Lainesse: I talked to them about the project many months before the event. I encouraged them to go on the internet to see what Phil Minton's work was about, I told them I thought this was a great opportunity for them – something new, something that can make them practice letting go and being in the moment. It was not our first project with FIMAV, and we had a good experience previously. SB: What was the impact of the voice exercises? SL: We worked with Phil for three consecutive nights, three hours each night. The first night we – and I include myself – did not really know what was going on. It gradually became clearer at the second and the third practice. The voice exercises were fun to do, but a little hard on the vocal cords, and the throat, too. Phil Minton is a calm and very generous person. He took us to where he wanted very smoothly, with a lot of respect and sensitivity. The voice exercises made the choristers aware of the infinite possibility to show emotions with voice. The fact that every sound was okay gave us the freedom to fully express each emotion. SB: Can you describe some of the reactions that different choir members had to the unusual freedom of the Feral Choir? SL: Some choristers quit after the first night. They did not understand what was going on. Some others asked questions that showed their insecurities: “Are we going to do the exercises in a particular order at the concert?” “How should we dress?” “Are you going to place us in a certain way?” “How do we sound?” “Do I have the right to do this or that?’’ Most of the reactions after the second night were very positive. I personally felt very inspired after each practice. I write songs and when I came home after a practice, I felt ready to express myself and write music and words. I felt connected. SB: What was the process of the workshops like for you? SL: Well after a day of work, spending the evening standing up and singing, of course I felt some tiredness. But my soul liked it a lot. The first night was a strange experience, because, even with my experience as the leader of the Choeur Daveluy, I did not really know what was going on. But then, it all became clear. This was an experience of letting go, and being who we are, and no judgment on anything or anyone. I particularly enjoyed the parts where Phil was improvising, and we were supporting him very freely. I thought I was contributing to something special and great. SB: Did the choir seem different before the performance than it usually would before a performance? SL: Yes, the choir was different. That was no stress at all before the performance, like there usually is. Like them I had zero stress. They had nothing to memorize, nothing to prove, they just had to be in the moment and follow Phil's directions. SB: Did the choir seem different after the performance than it normally would? SL: No, I think they were feeling proud and grateful, as they do after a normal performance. SB: Do you think the Feral Choir experience will have any lasting effect on the choir? SL: Yes. The letting go, the confidence in the leader, all the possibilities of the voice. As the director, I will include some exercises in my warm-up. And I might just add a short experience like that in our next performance. It was a very positive experience for me as a human being, as a musician, singer, and leader of a choir. Stuart Broomer: You mentioned that you started doing the Feral Choirs in the late 1980s? Do you remember what triggered going from workshops to the choir performances? Phil Minton: I have to start a bit before the first workshops. I had been described in the early 80s by friend, poet, musician and performer Lou Glandfield as a feral singer. I'd never heard the word feral before, but checked it out and thought: Yes! That’s ok: the voice released or escaped from “civilized domesticity” finding its way again, away from the constraints of nationalist culture, religion and all the other stuff laid on us from birth. About this time, we had a group that played on the improvised music scene in London. It was Hugh Davies, Roger Turner, Alan Tomlinson and me. I suggested the name The Ferals, very apt for all participants. We made an LP for Leo records. We never worked a great deal, but the feral concept was always with me. When I was asked to do some workshops in Stockholm, the feral voice was my method, but I also felt we must perform the results, so the “Feral Choir” did its first gig at Musik Centrum Stockholm back in the eighties. SB: Can you describe the kinds of exercises you do? PM: I hum, yodel and laugh for voice health, I encourage participants to do the same. I talk as little as possible, bad for the voice. SB: Do performances have a developed sequence of events? PM: No, we start with improvisation, which is never the same, then some simple signs, in no prescribed sequence, that can be interpreted quite freely by the singers, who then lead me into the territory of surprises. There are surprises all the time. I use my old voice riff “Louis Kappa” and variations on occasions if I think the performance needs it. It's the only bit that's very slightly composed. SB: It seems like an experience outside of language? Do you intend to step outside the cultural specific of language? PM: I hear it as music. SB: Have you ever worked with texts with the Feral Choir? PM I do sometimes sing "Mourn Not the Dead," a modal song with words by Ralph Chaplin of the IWW and original tune by Frankie Armstrong that I improvise on. I am in the process of “composing” a specific voice piece called Grunwick, no words, that can be performed by the Choir; I did some parts of this with the Feral Choir in Victoriaville. I would love to record it sometime with "Feral Chorus" which will be a group of about 20 committed Feralists from the improvising voice world. SB: The choir seems to represent a challenge to participants in some ways. PM: Yes. They enjoy it too. SB: Do you get drop-outs in the process? PM: Some people find laughing, or even pretending to laugh, difficult. Fair enough. They often leave after the first session, sadly, but not always. The drop-outs are more likely to happen in the larger and less intimate choirs where I have less direct contact. SB: Do you have any immediately memorable moments of people engaging with the process? PM: I've performed and done workshops with feral choirs all over the world, with homeless people, opera singers, scientists, prisoners, musicians, handicapped and even jazz singers ... hundreds of fantastic musical memories. In Katoomba, Australia recently, we did a feral choir workshop and a great performance to an audience of about three. A choir member, a gentle quiet old hippy about my age – 71 – said afterwards, “Thanks, Phil, you've changed my life.” I hope he didn't go off and become a banker. SB: What do you take away from the Canadian performances? PM: In both Ottawa and Victoriaville I’ve been touched by all the singers’ generosity of spirit and curiosity to try new stuff. That made both performances unique and memorable. Minton has resisted putting out CDs of any complete Feral Choir performance. “If I put out a CD it would be finished in a way,” he remarks; but some Baltimore Ferals can be heard on Enigma Carols (Recorded rec 019). He has also posted sound and video files of performance excerpts at his web-site: http://www.philminton.co.uk/feralchoir.html.